After extensive investigations of rock layers in Marias Pass, a shallow valley near the base of Mount Sharp, the Curiosity rover is now heading southwest again, to continue gradually climbing the lower slopes of the mountain. Marias Pass is a region with rocks and ground which contain high levels of silica and hydrogen, more evidence that there used to be a lot more water here than there is now. The rover finished its science activities on Aug. 12, which included drilling the rock target “Buckskin” as well as taking photos to create a new “selfie” image, which is taken from a lower angle than previous ones. Since leaving Marias Pass, Curiosity has moved another 132 metres (433 feet), bringing its total odometry, since landing in August 2012, to 11.1 kilometres (6.9 miles). While the rover continues driving, the onboard laboratory is busy analyzing the powder drilled from the rocks at Buckskin, which will provide more information about why there is so much silica and hydrogen in them. The silica, studied with Curiosity’s laser-firing Chemistry and Camera (ChemCam) instrument, is a rock-forming chemical containing silicon and oxygen, and is commonly found on Earth as quartz. The hydrogen is in the ground just below the surface and has been examined by the rover’s Dynamic Albedo of Neutrons (DAN) instrument. The hydrogen molecules are bound in or on other minerals in the rocks and soil, and have been detected all along Curiosity’s path so far, in lesser amounts, though, than seen in Marias Pass. 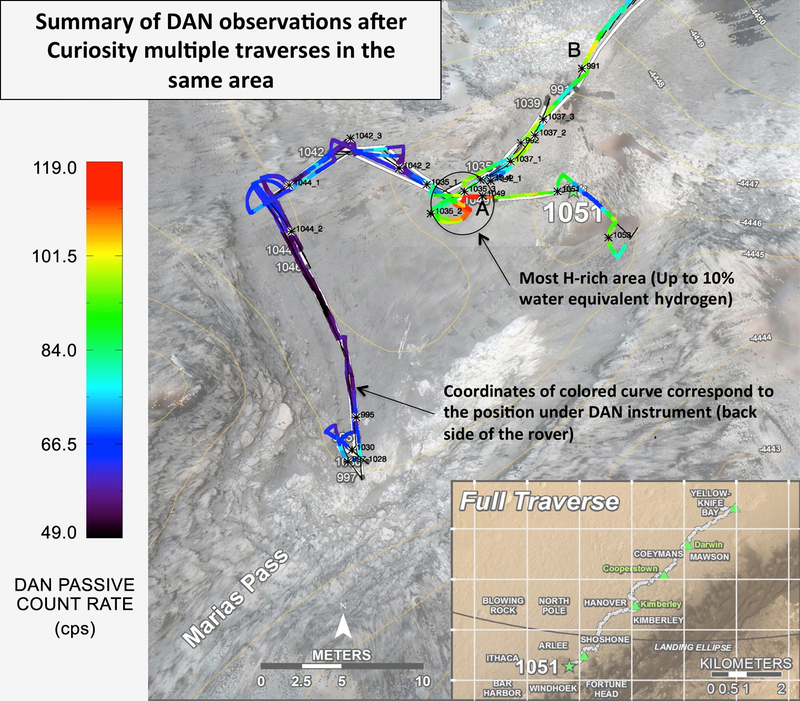 The higher levels were first seen by the DAN instrument while in passive mode, and then later again in active mode, when the instrument shoots neutrons into the ground and detects those that bounce off the subsurface, but preferentially interacting with hydrogen. The DAN instrument points downward to the ground while the rover travels, collecting data on the levels of hydrogen. The findings show hydrated material (containing bound hydrogen) covered by a layer of drier sand and soil. 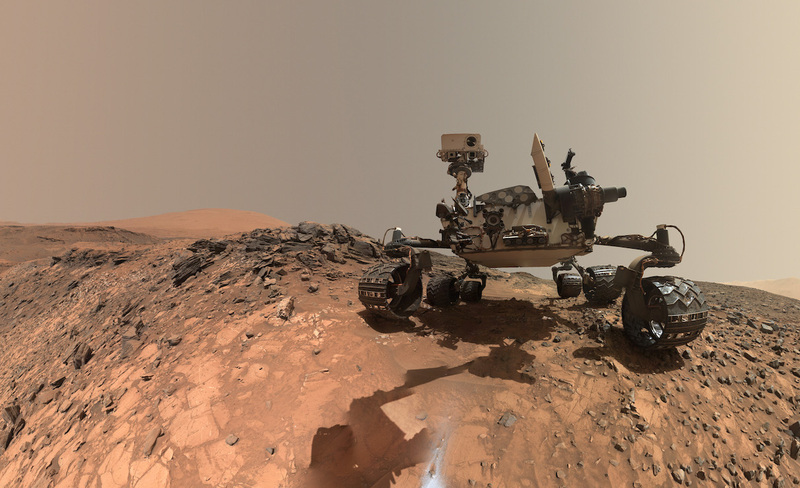 The high levels of silica and hydrogen were first found on May 21, while Curiosity was travelling toward a location where two different types of sedimentary rock are in contact with each other. On one side of the contact is a pale mudstone, similar to that seen earlier in the mission at Pahrump Hills. On the other side of the contact is a darker, finely bedded sandstone. These types of contact zones can help scientists understand changes in ancient environmental conditions which created the two distinct types of rock. 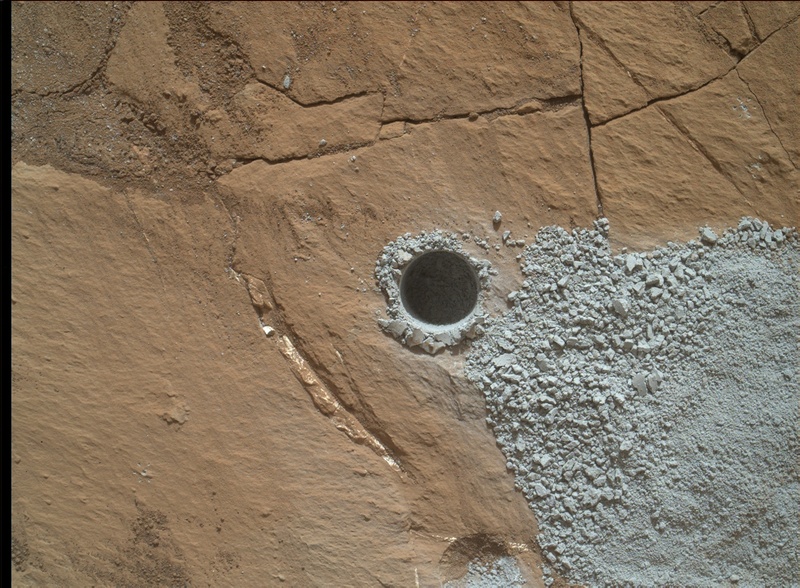 The changes in silica and hydrogen were significant enough for the rover science team to decide to return to the location and get a drilled sample for analysis. There was some concern about a small, transient short circuit on the rover seen last February, which occurred during the transfer of sample powder from the third target drilled in the Pahrump Hills area. This time, however, all went well. Silica is also known to be ideal for preserving organic material on Earth, making it an even more interesting target for further study. 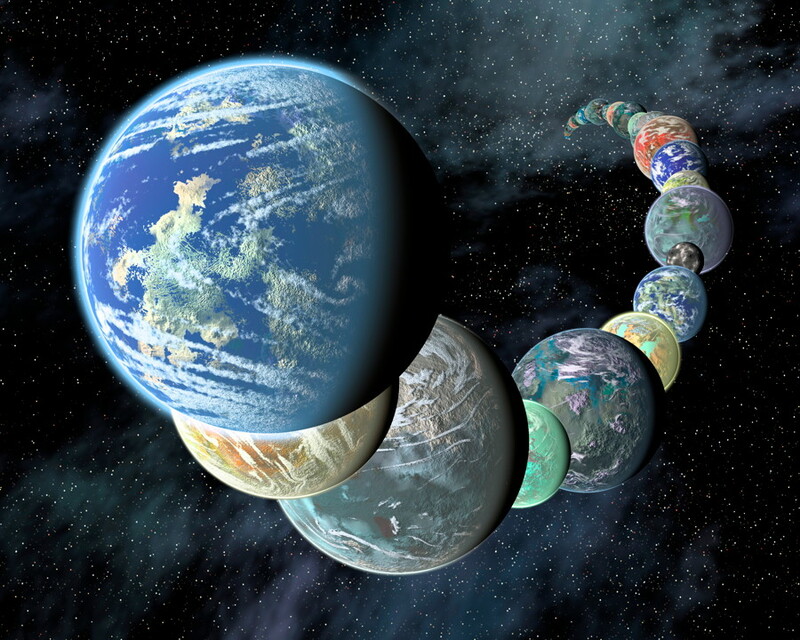 Some carbon organic material has already been found by Curiosity, but scientists would like to find more, even more complex types which could be the precursors to biological activity, or, perhaps, even the remnants of now extinct microorganisms. Curiosity isn’t meant to be a life-detection mission, but can still closely study any organics found in the rocks or soil. Curiosity is now travelling along the base of the lower slopes of Mount Sharp and will continue to gradually climb upward in the weeks and months ahead. The mountain itself is extensively layered, with many canyons, mesas, and buttes – reminiscent of the American southwest, but much colder. There are also large areas of dark sand dunes around the base, but for obvious safety reasons, the rover won’t venture directly into them. The rover has completed already three years of investigations and, being nuclear-powered, should be able to continue for at least several more, barring any accidents or other damage. It has confirmed that Gale crater, where it landed in 2012, used to be a lake or series of lakes, with fast-moving streams emptying into it a long time ago. This location as once much more habitable and life-friendly than it is today. 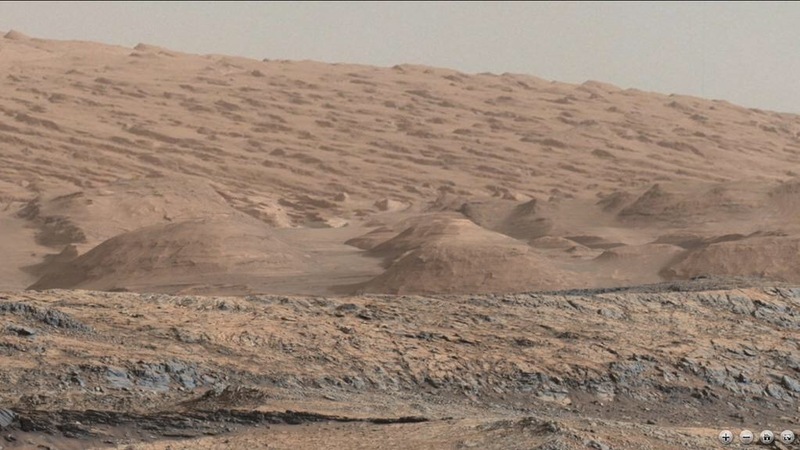 Mount Sharp is located in the center of Gale crater, and scientists want to see what additional clues it holds as to the past environment in this region of Mars. Curiosity has also found evidence for possible brines in the soil, methane in the atmosphere, ancient continental crust (the precursor to tectonic plates), and nitrogen in the soil which could have been used as energy by microbes. While Curiosity hasn’t proven that Mars used to have life, it has conclusively shown that the conditions were once ideal in this region for microbes to have survived and flourished; whether they actually did exist is, of course, still another as-yet unanswered question.